These are banks that don’t have physical branches, that only exist as an app on your phone and are extremely intuitive and simple to use. You may know them as ‘mobile banks’, ‘digital banks’, ‘app-only banks’ or ‘neobanks’. It’s as simple as opening a bank account through your phone, with your own account number, sort code, IBAN and all the rest. I’m a huge fan and currently have accounts in 4 different neobanks (oops). I also am an intern at the first neobank in Barcelona (very exciting 😍). So as you can guess, I use them everyday and even know the insides of how they work. I am currently not affiliated to any of them, all I want to do is explain how they work, why they’re amazing and how you can use them to your advantage. To put it simply, they are banks that only exist as an app on your phone. No branches, no long queues and all that tralala. Creating a bank account is as simple as downloading the app, verifying yourself with your passport and transferring money into your account. You receive your debit card at your home and voila, you have a bank account! You save time: You can imagine why this is so practical; when I wanted to open a bank account with RBS, I had to go into the branch, make an appointment, have the right papers with me, make sure I had proof of residence and have quite a bit of patience. 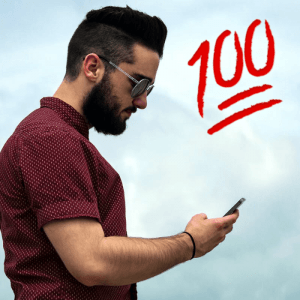 With Starling Bank, it took me less than 5 minutes and it was all from my phone. See where I’m getting at? You save money: Some other reasons I love neobanks is because they don’t charge commissions. It doesn’t cost me £10 to send money overseas, it doesn’t cost me 2% every time I use the card in another country, it doesn’t charge me just for being a client. And with an online only bank like Starling or Revolut, I can literally see, on the map, where every single transaction took place, with which merchant and at what time and date. Pretty lit 🔥. But are they safe? You ask. Well let me explain: any online only bank with a banking license is just as safe as any other traditional bank. Revolut, Starling and Monzo all have licenses, meaning that up to £85,000 in your bank account is protected by the FSCS. In Spain up to 100,000€ are protected by the FGD. Every country has their own financial institution that protects your money up to a certain point. So if the neobank collapses and you have money in there, you’re covered. In terms of day to day security, neobanks use biometrics (your fingers) and your phone, which is just as secure than what traditional banks use. Anyway, the best way to check them out is to try them for yourself, and guess what? All you need to do is download an app! I’ll shut up now, let’s move to how you can use these neobanks for budgeting. There are more and more online only banks popping up all the time, so which do I pick? Which do I use to budget with? 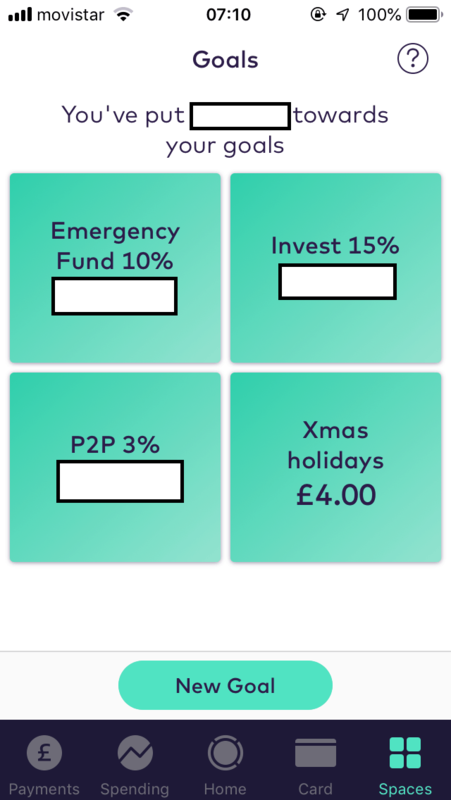 At the moment, the only one that offers in built budgeting is Revolut and Monzo (although depending on when you read this other neobanks will also have it). Other cool online only banks include Monzo (UK only), Starling (UK only), Revolut (Europe + UK) (you get £5 if you sign up with this link) and N26 (Europe + UK) (get £15!). Revolut is also great because anyone in Spain, France and other European countries can open an account. The trick is to use these neobanks for your day to day expenses. This makes it easy to track, easy to control and therefore way easier to budget. I use Starling Bank as my account for day to day expenses; I transfer my monthly salary to it, I transfer what I earn online to it and any other income to Starling. Since they don’t have an in-built budgeting feature, I link my account to Yolt so I can easily budget. Another very cool feature most online only banks have is ‘Vaults’ or ‘Spaces’. Basically little pots of money that you can keep contributing to to work towards your goals. A great way to save and some even round up your expense automatically. Although you can also simply link your traditional bank account to a budgeting software and work from there, I really recommend checking out neobanks so you see how easy it is to use them. Get your card in the mail and be ready to use it. I’m going to take the example of Annie. She downloads Revolut, likes the look and feel and decides to transfer in £50. She now has to set a budget to figure out how much she wants to spend on different categories this month. Which gives a nice total of £800. 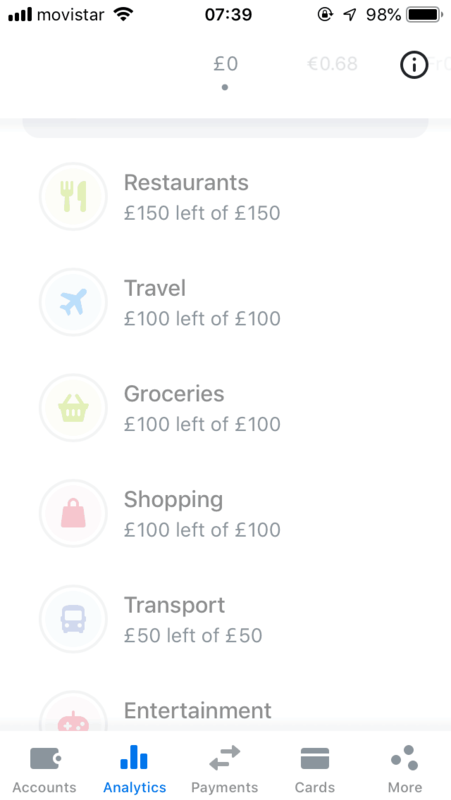 You will have to tell Revolut which expenses go to which categories for the first few times, but then it will remember and categorise the expenses for you. This system makes it super easy to budget, because at the end of the month you’ll know how much you spent on each category and can easily control during the month. It also means you have two bank accounts; the neobank for day to day expenses, and the traditional account for savings, big transfers and all the rest. It’s up to you how you want to manage it! As you can guess, online only banks have indeed made my life A LOT easier. When I went travelling around South America I didn’t have to worry about stupid transactions fees, about getting my card blocked or even about getting it stolen. Most neobanks allow you to easily block or freeze your card from the app in case it gets stolen. You can even create virtual card if you want to remain anonymous in the online world. Neobanks have made it easier for me to save money, to budget and to control where my money is going. Revolut now also has cheaper travel and medical insurance and even offers personal loans and crypto – although obviously I would stay away from both of those things until you’re sure you know what you’re doing. The only downside for the moment is that if you get your phone stolen, it gets a little tricky. Although you can log in from someone else’s phone, you also need your SIM card. N26 is the only neobank that is also available on desktop – hopefully the others will follow! So as you can see, I am a pretty big fan of online only banks and think that they’re a huge help when it comes to money management and budgeting, especially budgeting. Why not try it out? No need to even put money into it (or just use the free £5) – see how the budgeting feature works, how you can exchange currencies and do transfers overseas. Let me know what you think 😉.